Bye-bye customizations, hello to a more stock-like approach. 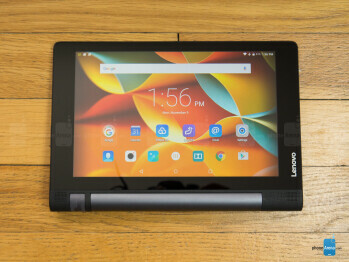 In a stunning change, Lenovo has scaled back the experience on the Yoga Tab 3 by offering a simple, more straightforward interface – one that definitely has more stock-like qualities than before. What’s more surprising is that they’ve brought back the apps panel, which was eliminated entirely with the previous efforts. Naturally, this brings back some sort of order to the homescreen, seeing that it makes for a less cluttered organization. Functionally, most of the native apps are ones we all know and love from stock Android, so they sport the same Material Design traits with their presentations. In addition, they’ve also relaxed on the experience’s multi-tasking experience. Gone is the multi-window pane from last year’s interface, providing us with pop-up views with some of the core apps, replaced instead by Android’s tried and true Recent Apps menu. From the looks of it, Lenovo has opted to go with a more stock-like approach with its Android 5.1.1 Lollipop experience. This makes perfect sense in unifying the tablet’s approach to offering a simple, hassle-free experience that anyone can quickly pick up on. Stick with the easy and light operations, seeing that it strains with intensive ones. There’s nothing pretty about the processing hardware in tow with the Lenovo Yoga Tab 3, since we all know its intentions of being an entry-level tablet. With that in mind, its quad-core 1.3GHz Qualcomm Snapdragon 210 chip with 1GB of RAM and the Adreno 304 GPU suffices for light operations, but quickly crumbles under the pressure of more intensive stuff. Case in point, gaming – just don’t even bother! Boasting 16GB of internal storage, it’s a tally that can be supplemented by slipping in a microSD card into the available slot just behind its kickstand. The screen’s resolution makes it incredibly tough to make out fine details when web sites are viewed in their entirety, but that’s something that can be quickly remedied by pinch zooming. For the most part, the web browsing experience suffices, even though it’s a bit jerky at times with its navigational controls and page rendering on the fly. 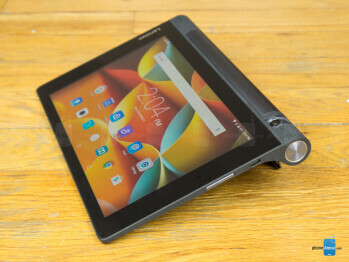 As it currently stands, the Lenovo Yoga Tab 3 8-inch is only being offered as a Wi-Fi-only variant, with no indication of carrying cellular-connected models. Much like all entry-level things, it features aGPS with GLONASS, Bluetooth 4.0, and 802.11 b/g/n Wi-Fi. Ouch, it’s just a disappointment across the board. The duty of snapping photos is solely placed on its single, rotatable 8-megapixel camera, which is on a swivel on its cylindrical hinge. This particular implementation is a joy in the world of front-facing cameras, seeing that selfies get the same amount of attention. Running the camera app, it’s your standard fanfare consisting of select shooting modes and manual controls, but we’d be hard-pressed to see anyone using anything except the automatic mode. Taking photos has never been one of the series’ redeeming qualities, so that’s probably why we don’t have much expectations from this one either. Yes, you have the option to snap photos at your discretion with the Tab 3, but why do so when you probably have better things lying around? Outdoor shots captured by the camera appear over-exposed at times, light on the fine details, and have a noticeably colder color reproduction. It doesn’t get any better under low light, as digital noise, minimal details, devoid colors, and its prone to blurriness, makes it an unlikely candidate for the occasion. Another indication of its poor performance is seen in its video recording quality, which tops out at a mere 720p – hardly the stuff of dreams nowadays. The terrible details capture of the camera just makes us want to cringe, and it doesn’t help either that its focus is slow to the adjustment. Just look away, your eyes will thank you! There’s some serious substance with Dolby Atmos support enabled. Many of the apps might be from Google’s stable, but Lenovo still manages to fashion its presence here and there. One of those places in particular is the music app, which looks nothing more like the dated music plater that debuted with Android 2.2 Froyo. It’s a throwback like no other, but it functions in the same capacity as any other player. Endowed with dual front-firing speakers, there’s certainly no shortage of substance with the 73.9 output of its speakers when Dolby Atmos is enabled – albeit, there’s just a hint of strain at the loudest setting. Without it, however, it sounds extremely thin and light. Stick with the former for a more rewarding experience. Those front-firing speakers with Dolby Atmos support lend their usefulness when it comes to watching videos, as audio is dispersed more properly. Even though there are subpar qualities about the screen, it suffices enough with its performance when playing back videos – made better by the fact we can use its kickstand for a hands-free experience. It goes the distance more than most tablets. 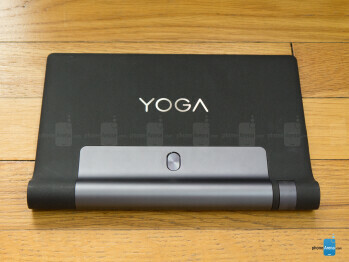 Lenovo has taken pride in the battery life of its Yoga tablet series, so it’s wonderful to know that there’s still a focus on it here with the 3rd generation model. Packing a 6200 mAh battery, down from its predecessor’s 6400 mAh capacity, it actually doesn’t impact its longevity, but rather, delivers even longer lasting results. In our real-world usage, its battery can easily yield almost a couple of days before being completely tapped out. Under our custom battery benchmark tests, it beats its predecessor handsomely by nearly a couple of hours, as it reaches 12 hours and 22 minutes in our testing. Stacking it up against its direct predecessor from last year, there are some unsavory decisions that would make almost anyone suspicious about the Lenovo Yoga Tab 3 8-inch. For starters, its specs sheet indicates that certain areas have been scaled back, indicating that it’s inferiorly spec’d to what they’ve produced previously. Clearly, this is the kind of tablet for those who want don’t want to be burdened with a high learning curve, or just don’t want to spend a fortune. 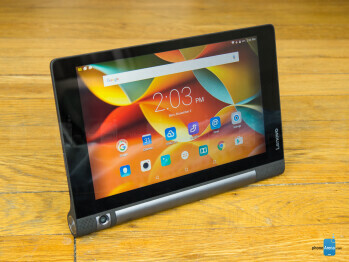 To that degree, the Lenovo Yoga Tab 3 8-inch does right by sporting a starting cost of $169.99 from the get-go, which is a bargain in the world of 8-inch tablets. If price clearly dictates your judgment, this is something that should be on your radar – just know that there are compromises in settling with it. However, if you’re able to spend just a little more, say $200, the Asus ZenPad S 8.0 would be a more attractive option.